One Panel of: 24"x 36"
Dimensions: One Panel of: 24"x 36"
When you're decorating your dorm, you'll have a lot of choices to make. If you want college posters to be part of your dorm decor, you'll have so many categories to choose from, not to mention posters themselves. But if you want your college wall decor to look different, you'll need some unique dorm items. 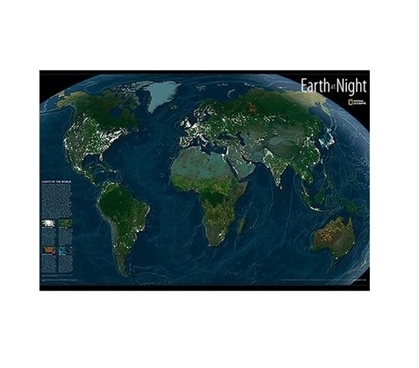 So add this Earth at Night Glow in the Dark Wall Art - Peel N Stick to your college decorations. This way-cool peel-and-stick supply will make your dorm decorations take on a life of their own! The glow-in-the-dark ability of this dorm supply will be a fun addition to any college wall decorations. Even though the adhesive on these peel-and-stick supplies for college is quite strong, it won't be so strong that it will be difficult to remove. Plus, your college decor will reflect who you are! Are you a green-friendly earth lover? OK, you don't have to take it that far, but you can have some creative and different dorm items for your walls. So create a cool night-time display with this college supply and let your dorm room stand out!